©2016 The Young Authors Foundation, Inc., d/b/a/ Teen Ink. All rights reserved. 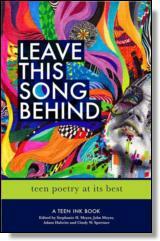 Reprinted from Leave This Song Behind: Teen Poetry at Its Best. No part of this publication may be reproduced, stored in a retrieval system or transmitted in any form or by any means, without the written permission of the publisher. Publisher: Health Communications, Inc., 3201 SW 15th Street, Deerfield Beach, FL 33442.